Order your custom license plates to show your love of Paul Smith’s College! 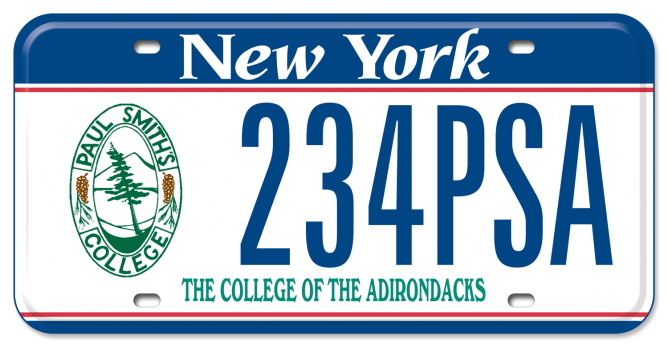 The New York State Department of Motor Vehicles and Paul Smith’s College have made this license plate option available to you. $10 of the cost of your license plate is a donation to Paul Smith’s College, which will help us continue our tradition of hands-on, experiential learning. It’s a great way to show your support! Click here for more information about YOUR CUSTOM license plates! 1. Register your vehicle with the New York State Department of Motor Vehicles. Click here for DMV registration information. 2. Fill out the DMV application for a custom plate. Click here for the application. 3. Send the application, along with a check made payable to “Paul Smith’s College” to the address below.